You are here: Home / Ingredients / Cooking with Vegetables / What Can I Do With All This Zucchini? So you have a few zucchini left, huh? You’ve given bushel baskets full to all your friends and family, you’ve set buckets on the corner with a free sign and they still aren’t gone. Now what do you do? Here are some recipes and tips from Living On A Dime to give you help in using them all. Zucchini can easily be frozen for the winter. Simply shred and bag into 1 – 2 cup servings. Use in breads, cakes or meat loaves. Substitute shredded zucchini for half of the ground beef in Mexican recipes, spaghetti sauces, meat loaves or meatballs. Saute zucchini in olive oil for 3 minutes. Remove from heat and add onion and garlic. Saute 2 minutes. Add zucchini to skillet and season with salt, pepper and thyme. Serve Warm. Brown chicken in oil 10 minutes, turning occasionally; drain. Add the rest of the ingredients except pasta. Cover and simmer 25 minutes. Serve over pasta. Preheat oven to 350 degrees. Mix all the ingredients in a bowl and beat on low for 1 minute, scraping bowl constantly. Beat on medium for 2 minutes, scraping bowl occasionally. Pour into a greased 9×13 inch pan. Bake for about 45 minutes. Serves 18. Wash all the vegetables. 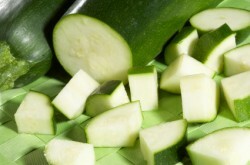 Slice the zucchini, onions and squash into thin slices. Put some flour in a bowl. Put egg and milk in another bowl and mix. Place crackers crumbs into a bowl. Put the vegetable oil in a deep saucepan or fry pan and heat to 375 degrees or until a few crumbs of cracker fry quickly. Dip vegetables into flour, then egg mixture, then cracker crumbs and fry until golden. Drain on paper towels. Salt and pepper to taste and serve hot with ranch dressing. Jill Cooper and Tawra Kellam are frugal living experts and the editors of http://www.LivingOnADime.com . As a single mother of two, Jill Cooper started her own business without any capital and paid off $35,000 debt in 5 years on $1,000 a month income. Tawra and her husband paid off $20,000 debt in 5 years on $22,000 a year income. Tawra and Jill are the authors of several frugal living ebooks, including Dining On A Dime, Groceries On A Dime, and Penny Pinching Mama.